Yanagi-ba-bocho or shortly Yanagi is a long and very thin knife, primarily used to slice boneless fish fillets for Sashimi and Sushi dishes, but they can also be used to fillet small to medium-sized fish and are often used for skinning fish. In preparing sashimi and sushi, there are very important conditions that the sliced cross section be smooth, shiny and sharp in a microscopic view. 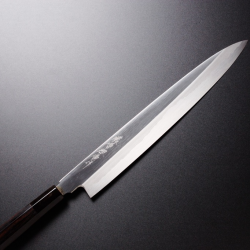 The narrow blade and relatively acute edge angle of the Yanagiba are features which greatly reduce the effort required to cut through ingredients. As with the Sujihiki, the long blade allows the fish to be cut in one single drawing motion, from heel to tip. The combination of cutting technique, acute blade angle, and sharp edge result in very little cellular damage in the cut surface. This is particularly important for dishes where the fish is eaten raw, because it helps to preserve the original flavor and texture of the fish. Length: 210 mmWeight: 115 grThis Sashimi knife has a 3-layer construction; the front and back sides .. Length: 240 mmWeight: 140 grThis Sashimi knife has a 3-layer construction; the front and back sides .. Length: 255 mmWeight: 165 grThis Sashimi knife has a 3-layer construction; the front and back sides .. Length: 270 mmWeight: 180 grThis Sashimi knife has a 3-layer construction; the front and back sides .. Length: 270 mmWeight: 210 grThis Sashimi knife has a 3-layer construction; the front and back sides .. Length: 300 mmWeight: 230 grThis Sashimi knife has a 3-layer construction; the front and back sides .. Length: 300 mmWeight: 250 grThis Sashimi knife has a 3-layer construction; the front and back sides ..